Alabaster Medicine Beaver Fetish 1. $45. SOLD. Here in Northern New Mexico, Beaver seldom shows his face to others, but he leaves plenty of evidence of his substantial presence among the trees lining the lakes, rivers and streams of the area. Jeremy Gomez (Taos Pueblo) has coaxed a hump-backed version of his image from a smooth, silky piece of smoky white alabaster. His features are shyly subtle, but his trademark cross-hatched tail gives away his identity. 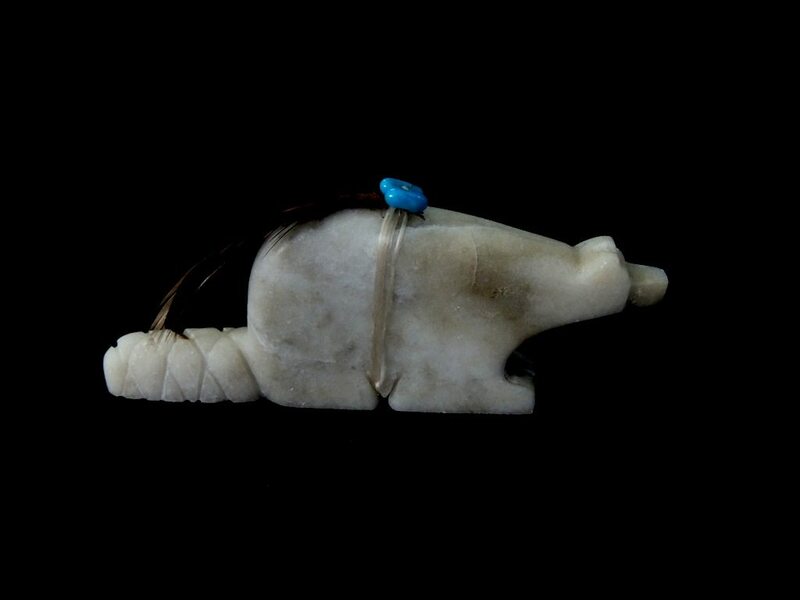 Two small turquoise beads hold feathers to his medicine bundle. Stands 4.75″ long by 1.25″ high (dimensions approximate). Posted on Sunday, October 19th, 2014 at 7:58 pm. Filed under: Fetishes	RSS 2.0 feed.